This is the first game in the Iron Man series. 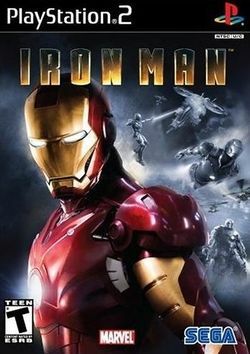 For other games in the series see the Iron Man category. For the mobile version, see Iron Man (Mobile). For the Nintendo DS version, see Iron Man (Nintendo DS). Iron Man is based on the 2008 film of the same name as well as the classic iterations of the character. It was released on May 2, 2008 to coincide with the release of the film in cinemas. It features the voices of Robert Downey Jr., Terrence Howard and Shaun Toub, reprising their roles from the movie. The enemies are Advanced Idea Mechanics, the Maggia and the Ten Rings terrorist group. The super villains in the game includes the Melter, Titanium Man and Iron Monger.